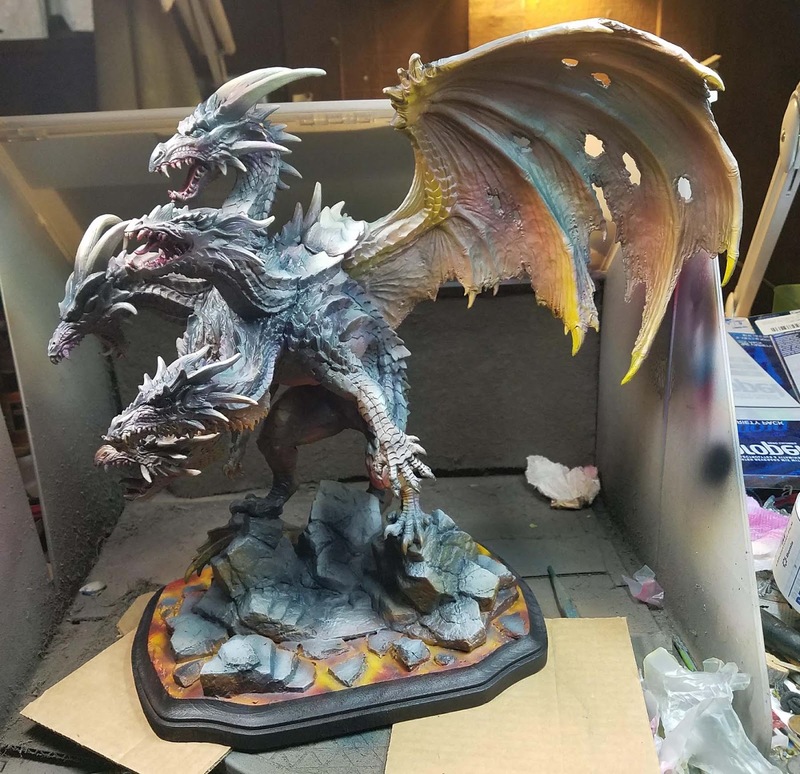 Over the last several weeks, I have been working on the big 5-headed dragon from Reaper. It is made from BONES material of course, which thankfully makes it very rugged! This will ultimately be finished off with oil paints, but I wanted to experiment with doing some follow up painting with the airbrush first. 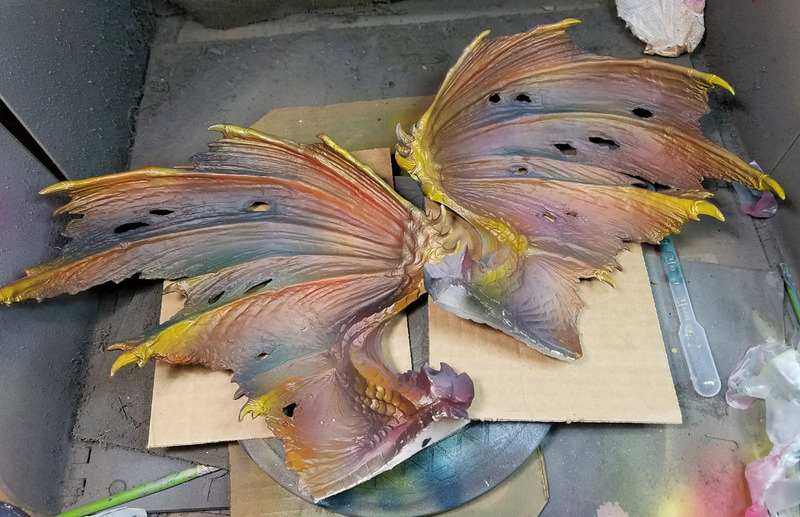 Once I decided to do a lava style base, it meant that I could do a bit of light reflection on the wings! On the flip side, I added more greens and dark blues, so that the orange tones would have even more contrast. 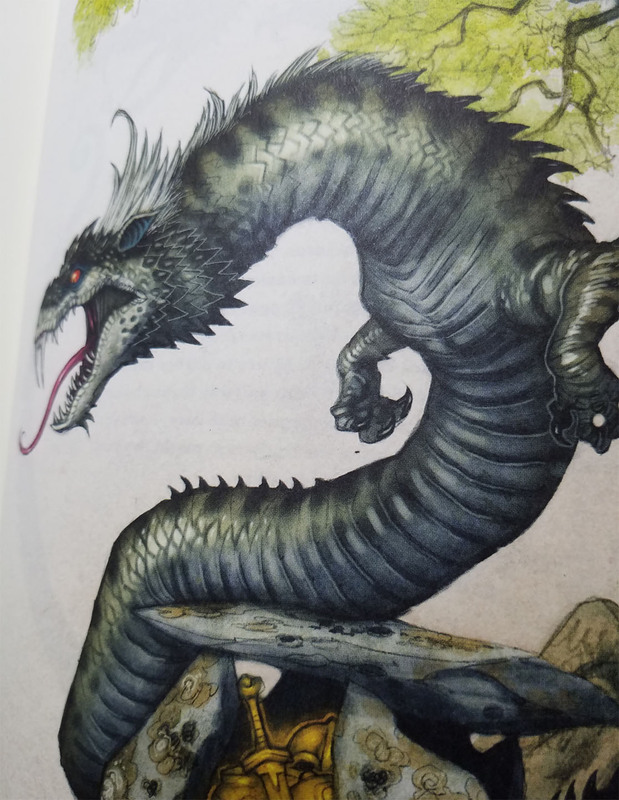 The same was done with the dragon body itself. You can see a bit of the base too, which was made with chunks of pink foam carved and textured to match the original stones. 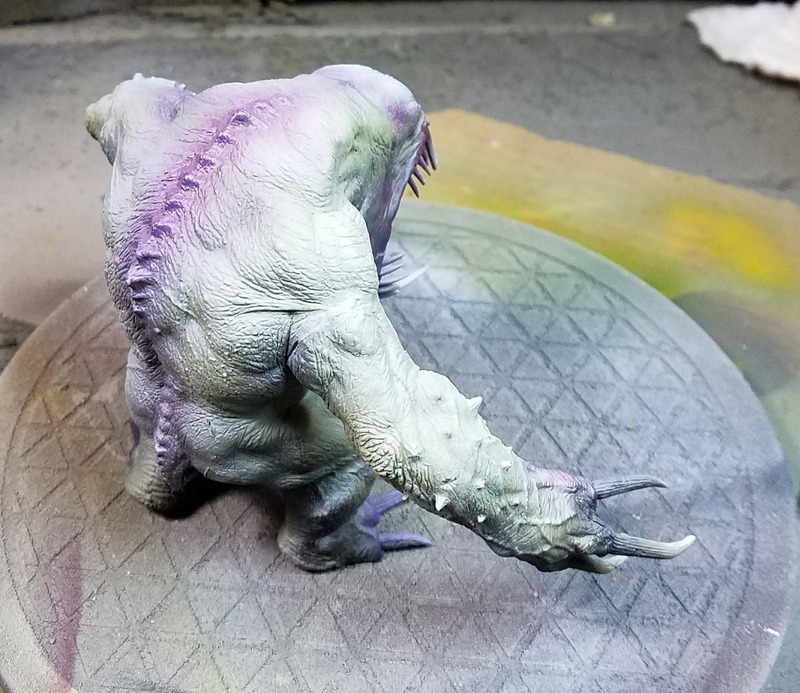 I don't have any fluorescent airbrush paints at the moment, but I know that I can do some very intense colors with the oils. Again, the idea here was to indicate where I wanted some of these lighter areas to be, and get a sense of "how much is too much" etc. This had been toned down quite a bit since by those subsequent layers of oils. 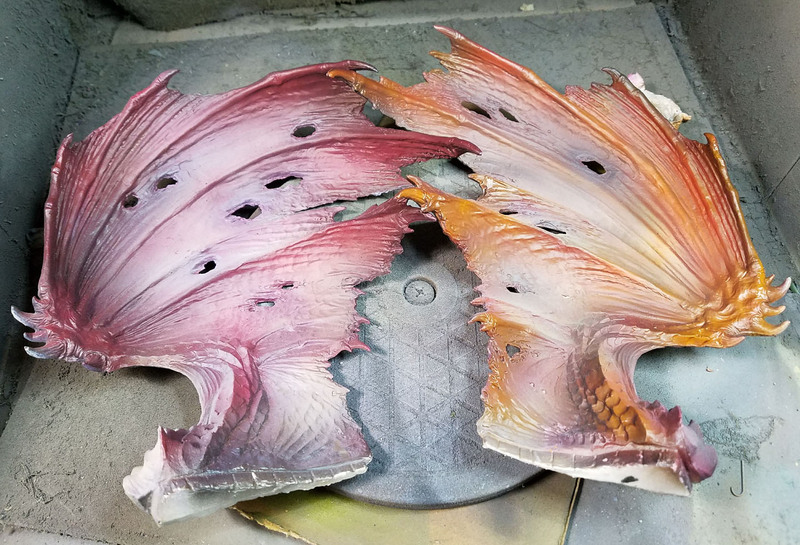 I stuck in the wings to get a quick peek at what they looked like on the body, which led to more course corrections prior to working with those oil paints. I tried to film a few sessions where I did that oil painting, and I will try to get those edited and posted as soon as I can to the YouTube channel! 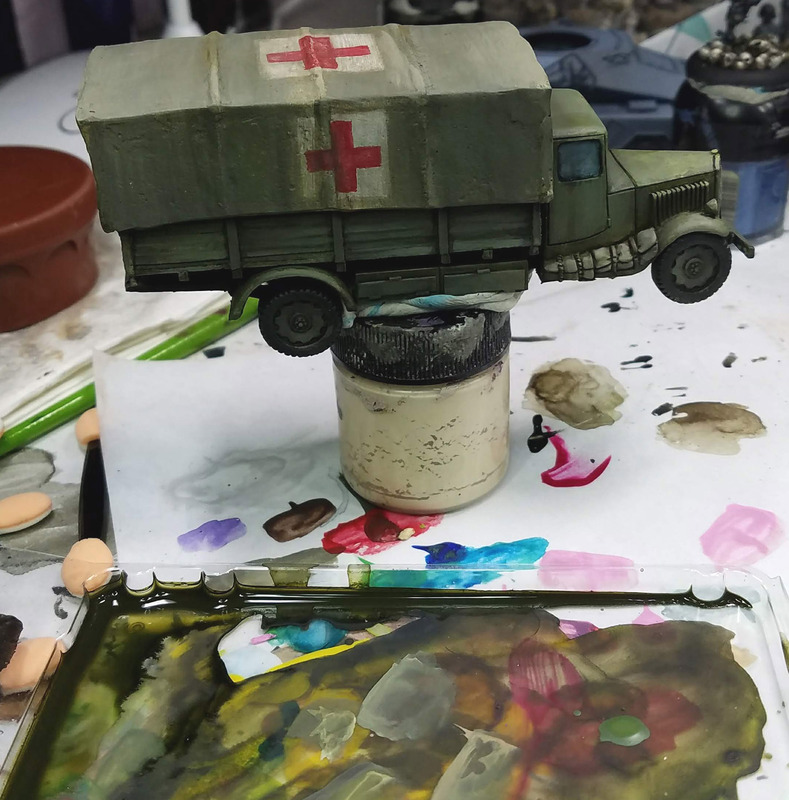 You have seen me post a number of articles on my "primer painting" in the last few years, but in more recent days you have seen me posting more actual airbrush painting. 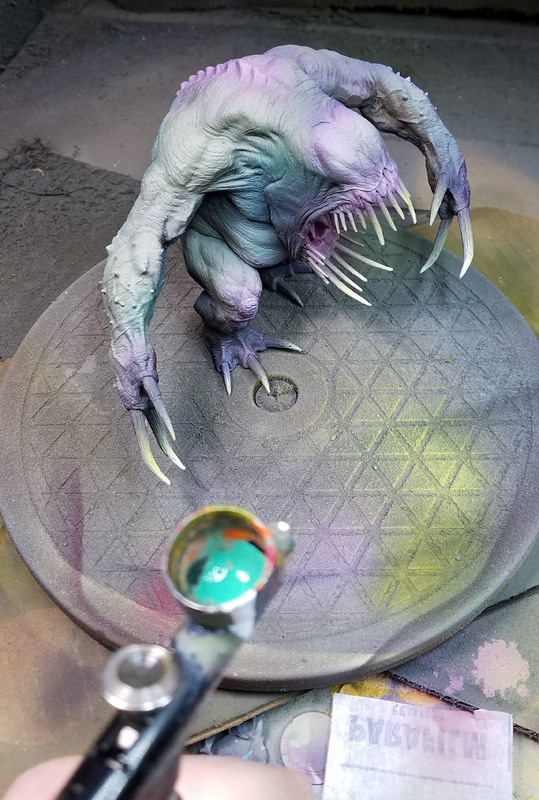 The last article talked about the lower air pressures and the results that would yield, but now I have a brand new tool which has opened up a new range of tactics with the airbrush! 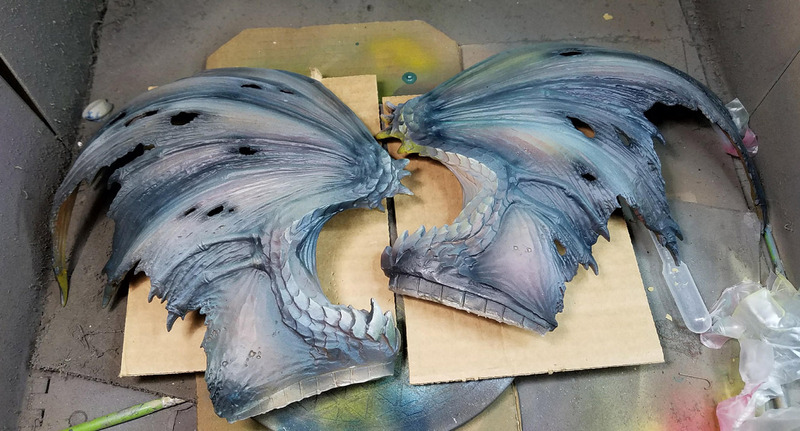 One of the reasons why I did not use the airbrush in more of a traditional method was the time it would take to mask off areas. It just was not worth the time to screw around with that, when I could paint the same kinds of things with my brushes, acrylics and oils. Even with the lower pressures, there are just some occasions where the only way to get the result you want is to mask off certain areas. 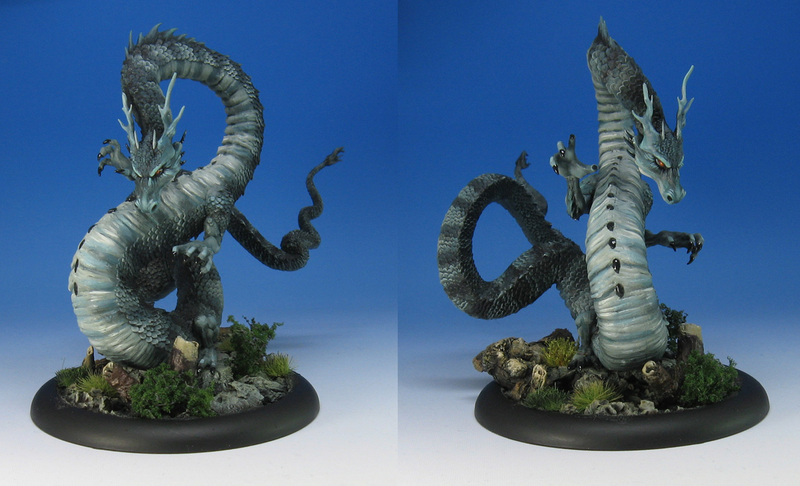 There were several on this big guy from Mierce Miniatures. The turntable he's standing on is about the size of a dinner plate, to give you an idea. 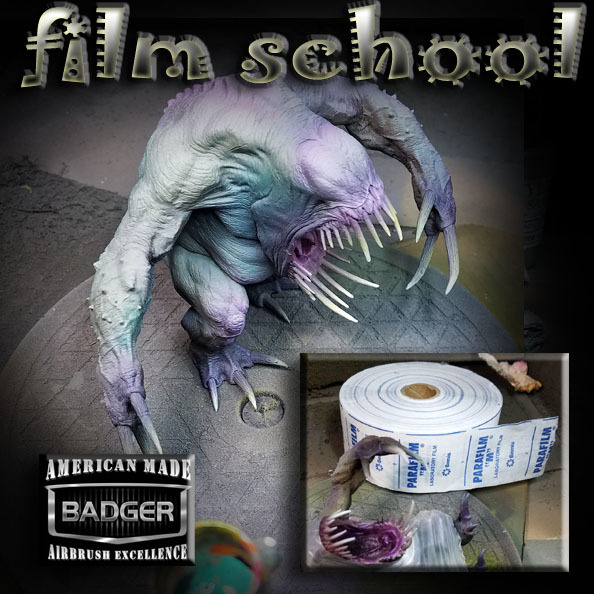 During one of my recent hangouts on the Styrene Syndicate, Gil and the guys told me all about something called Parafilm, which is easily available on Amazon. In effect, it is like super Saran Wrap (or cling film in the UK). You can cut off pieces of the "tape", which has a slight stick to it. 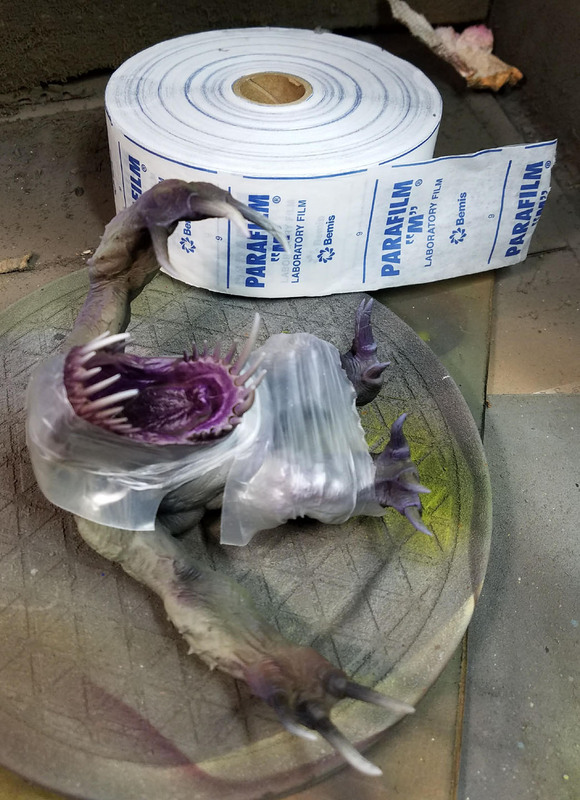 Once it is stretched out over an area as you see here, it has the Saran Wrap effect, and holds tight enough to get the job done quickly. I have not tried it on vehicles to do camo yet, or anything super precise. In fact, that is not what I needed it for. What I wanted was a way to "bulk mask" areas to that I could do things like the teeth, or even the inside of the mouth, very quickly. It only took a few minutes to get all these masks in place, which would have been much harder with the blue tac which I had been using. 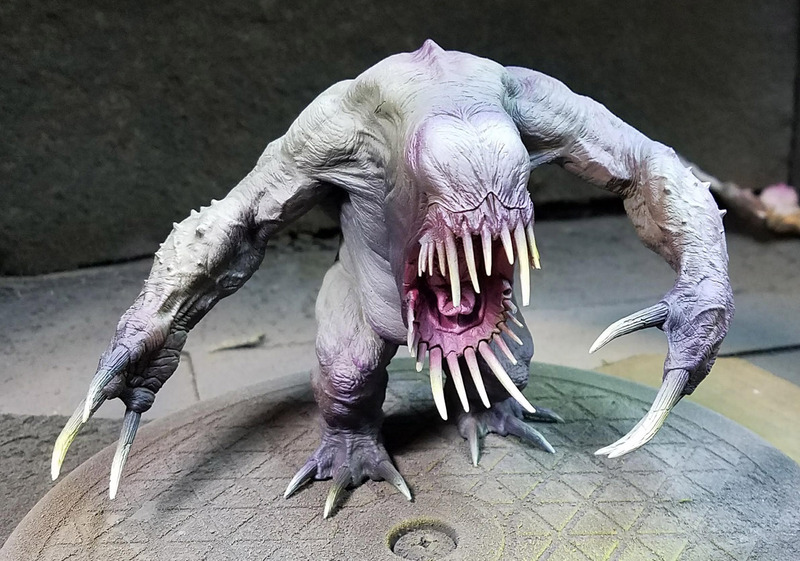 In the past, I would not have bothered to try and paint the teeth or the inside of the mouth with the airbrush. Even now, I will still be painting over a good portion of all of this with glazes, etc. 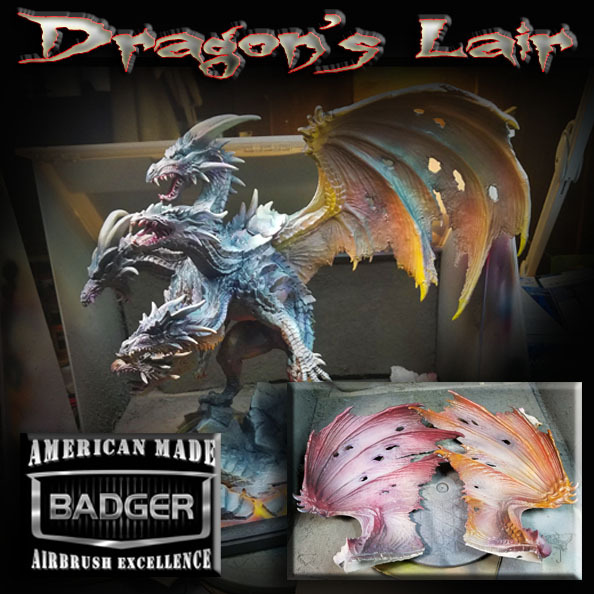 But, I have a lot of the Minitare Badger paints, especially some brighter colors that I have not exhausted on terrain pieces! 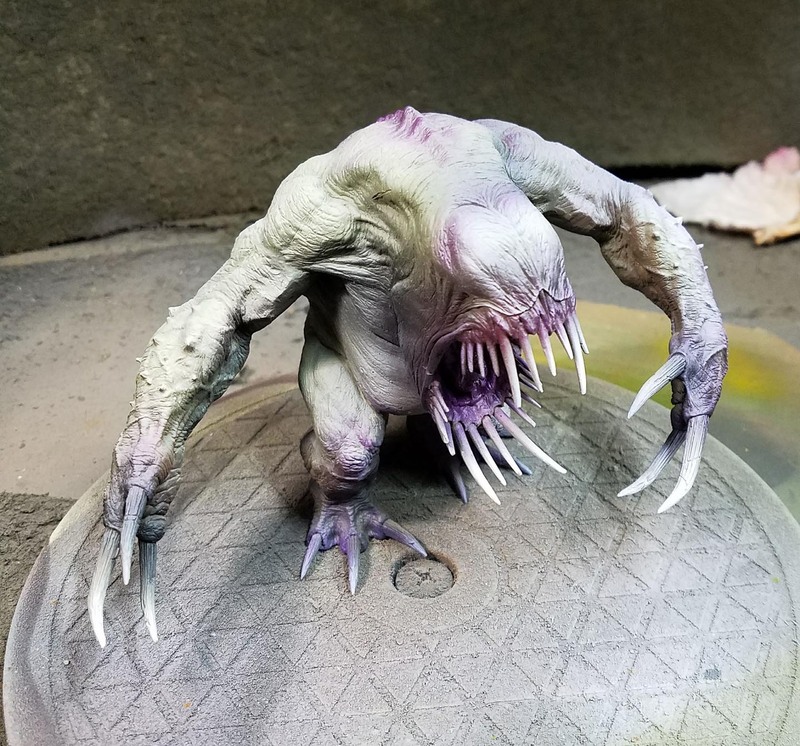 Another reason I like this new use of the airbrush is that I can try out some color schemes on the fly, and change them very rapidly if they are not what I wanted. That would be much more involved if I were doing this huge figure with only a brush. I hope that this gives you a new idea to think about, as the guys did for me! 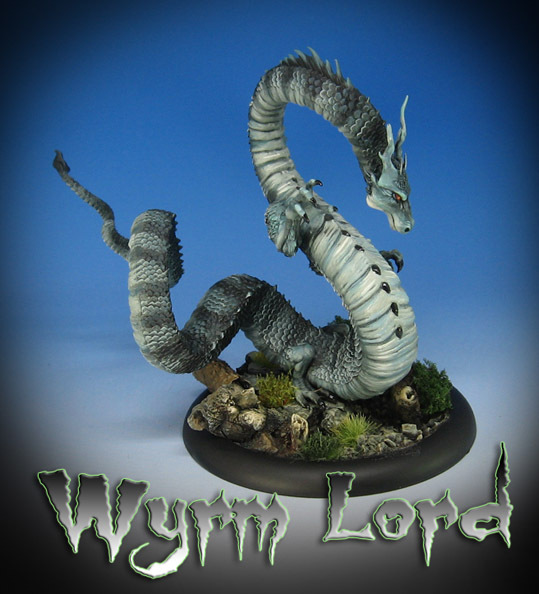 Many thanks to the folks who do the Styrene Syndicate hangouts. I learn something new every time! Many thanks to Gil who brought this up when I broached the topic, and pointed me in the right direction! 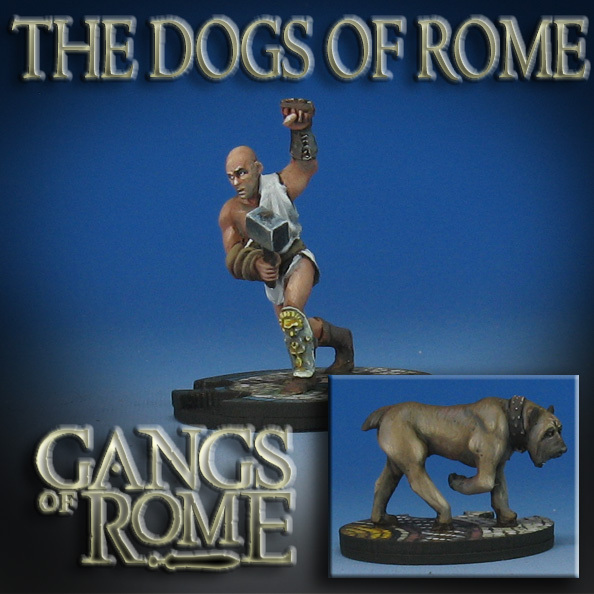 While the original posts in this Gangs of Rome series focused more on the mobs and the larger mosaic tile bases, I didn't want to forget the most important aspect of the game... and that is the Gladiators! 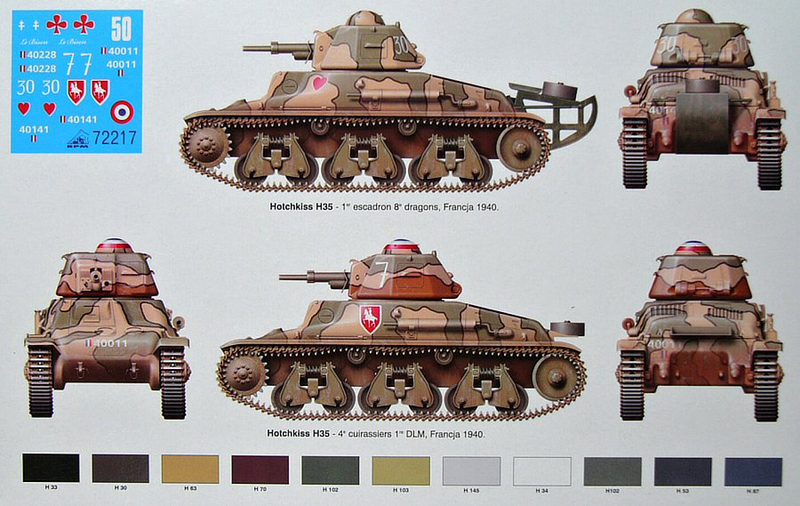 Here's a few more, and this time you get a better sense of how the ID number and wound counters fit into the bases. Most of the figures were painted with oils, part of a huge batch that I was working on along with a number of other figures. 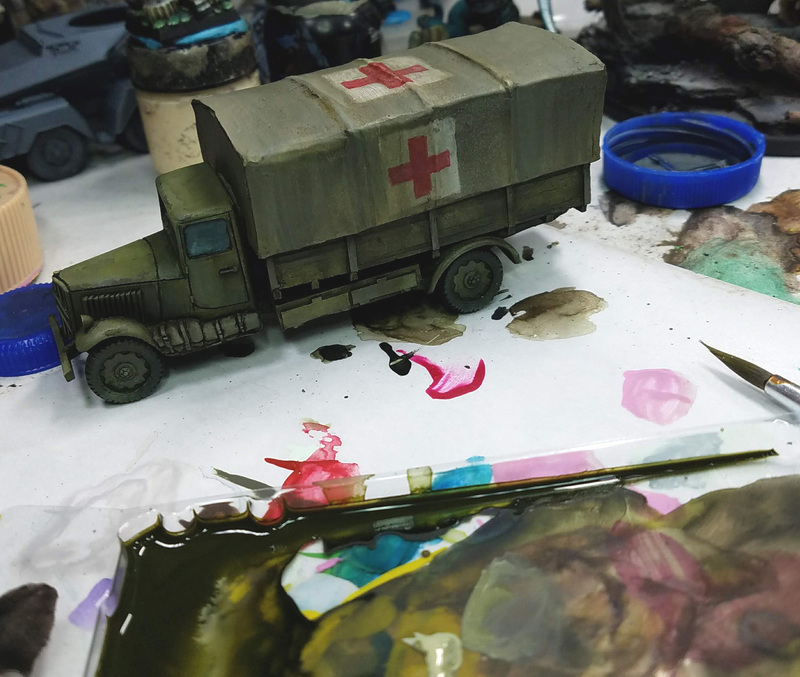 I have discussed the value of oil paints when tackling huge batches of figures, where the extended drying times make it easier to carry out blends on a large number of figures all at once. 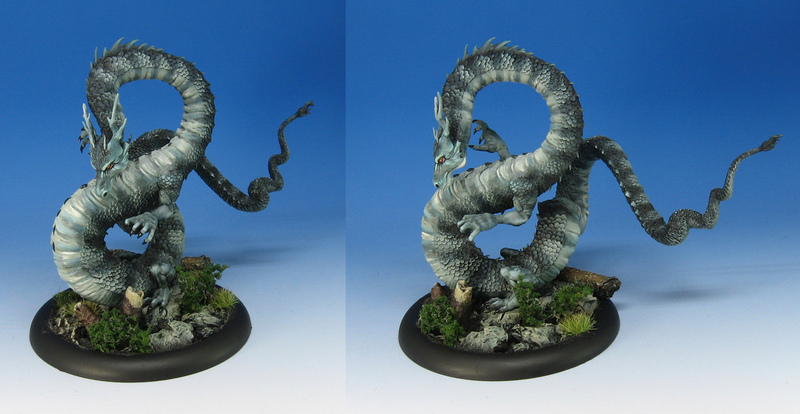 It is almost like having a wet palette for your miniatures! 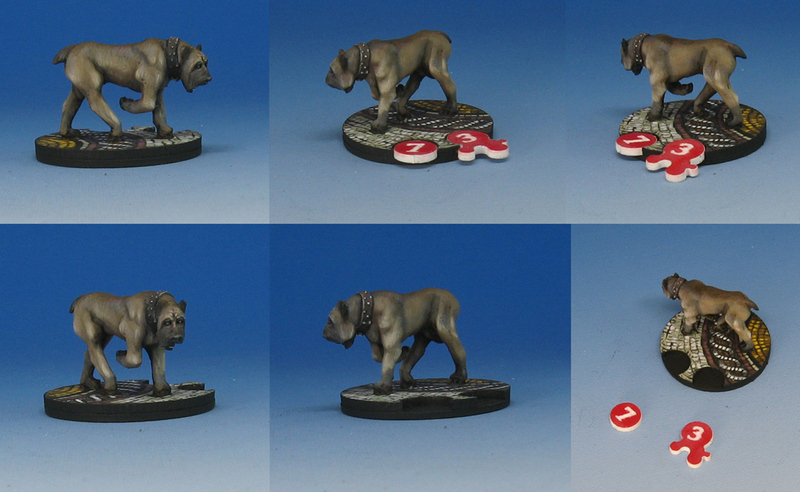 Finally, we end up with the Mastiff, who is one big puppy!!! This unusual beastie had a very specific color scheme request, which is very typical when you do commission stuff. We have been doing commissions for a very long time, since 2001. Sometimes you get very interesting requests, and sometimes very unusual requirements! You never know what that is gonna be, so you just have to roll on. Most of the time they are very fun, and this limited palette exercise was as well, done entirely in oils! What I love about the oil paints is the ability to mix very subtle color shifts right into the paint, instead of having to go back in with glazes, etc. I was able to sneak in those warmer ochre colors with no problem! I also experimented even more with glazing the oils. Since the capillary action is even greater with oil paints than water, I thought this would be a very good proving ground. 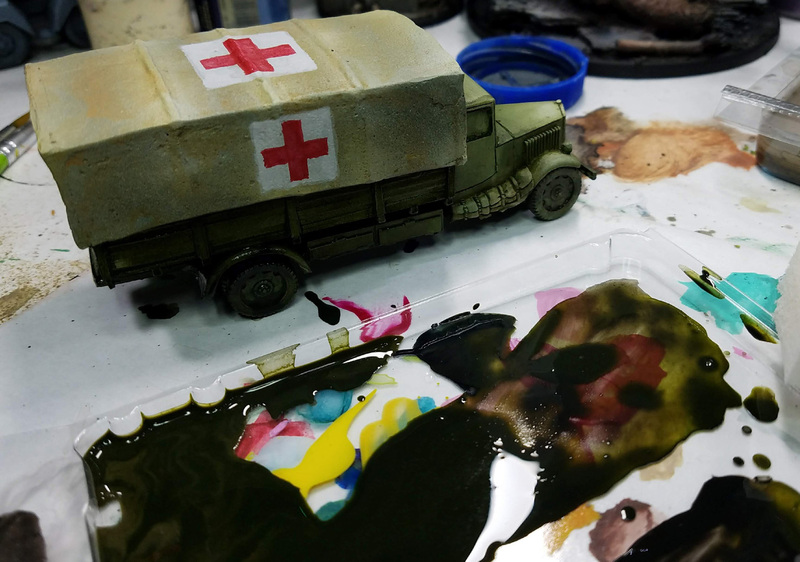 If you see any of the vehicle painting exercises, you know that people do those "panel line washes" or "Pin washes". Those are made possible by that enhanced capillary action, as thinned down oils (white spirits only!) make the paint so much thinner, it can even flow "upwards" against gravity! Whenever people would ask for advice on painting Non Metallic Metals, my response would always be to "reflect the environment around the figure as much as possible". In my recent live demos and previous blog posts, I have been emphasizing that more and more... but there are a few other tiny touches which can also make those 'metals' a bit more interesting with a little 'sparkle'. The first post from this unit had a purple/lavender color as an 'accent' tone. It probably did not even register to most viewers as purple, especially in person. However, it was still there, just as there is a greenish accent here. What this added color does is create a bit of "spectral" highlight here and there, as if light were refracting off parts of the surface. This is especially helpful on larger, broader surfaces like many you see on this figure. Otherwise it would simply be a sea of blueish gray! 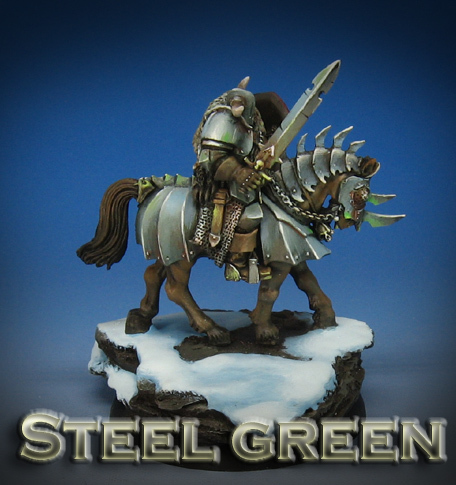 Now that I see many of these NMM paint sets floating around, I feel that it is even more important to talk about this concept. 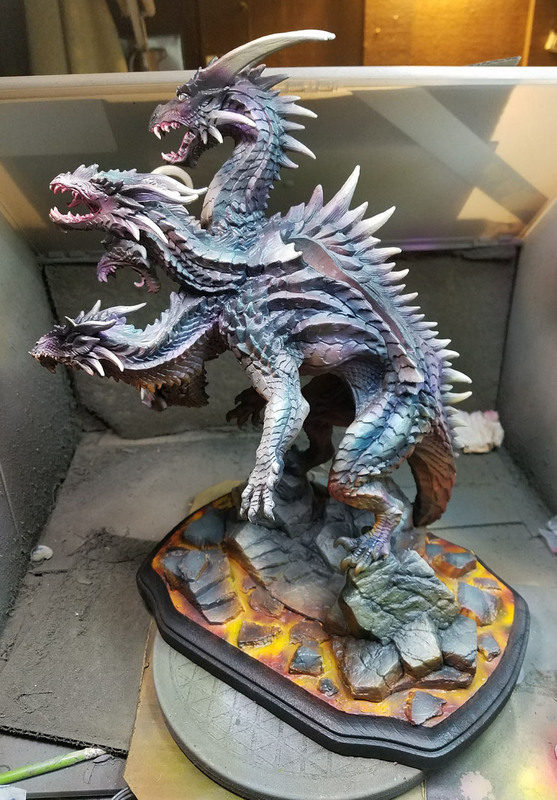 In some recent articles, I suggested that the best NMM paint set is whatever colors you are already using on your miniature and base! 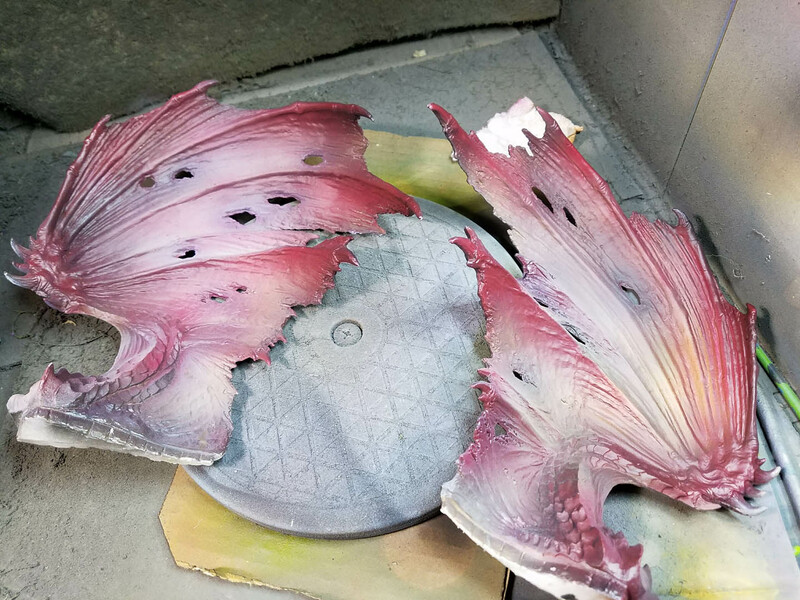 This really is the case... as incorporating as much of the surrounding color as you can into your metals (no matter what it might be reflecting) will make the viewer believe that those surfaces are in fact metal! 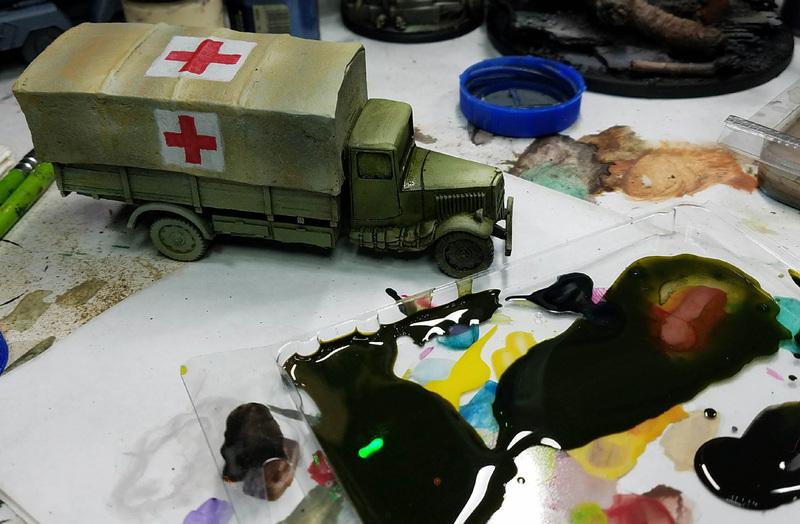 During another great hangout on the Styrene Syndicate, I was working on a vast number of projects all at once, which is pretty much normal! 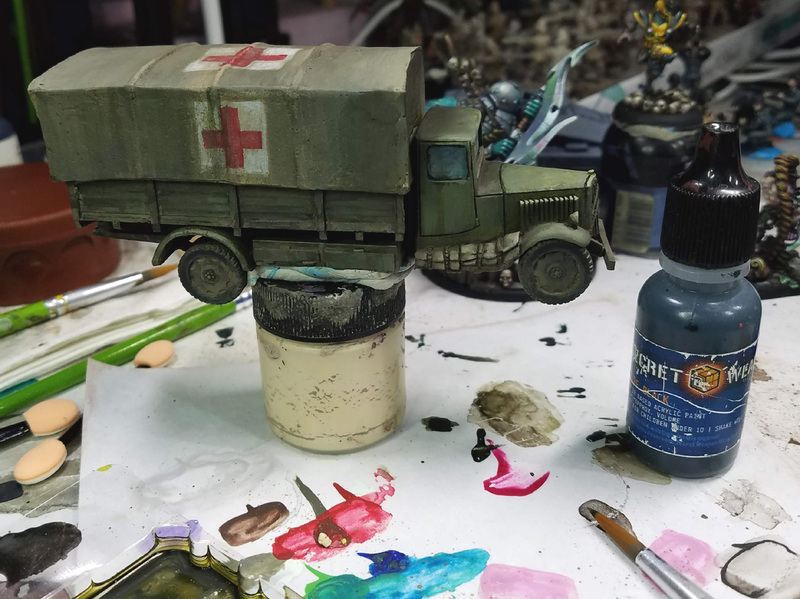 I was also trying to get a few more units ready for the next battle report, and this ambulance was one of them. There was not much time, so I had to do this one quickly. 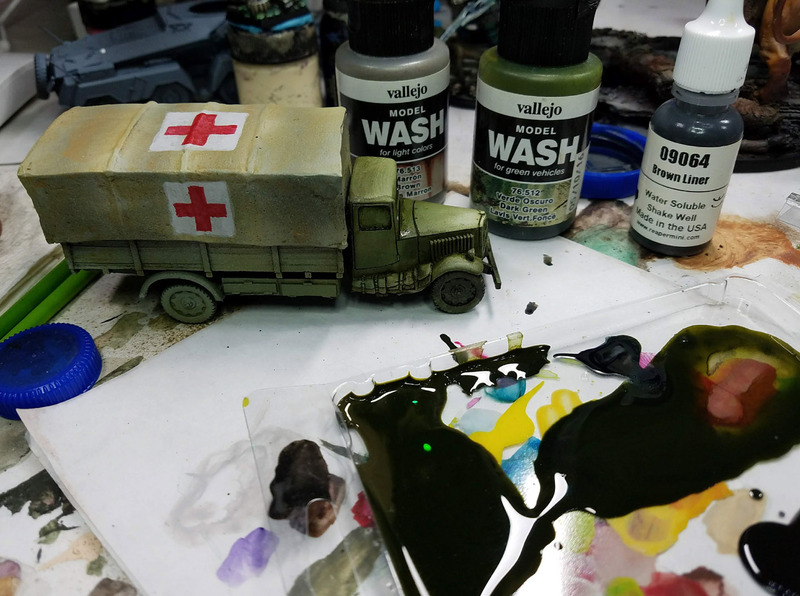 I brought out a few key paints, such as the Vallejo washes that I save for painting greenish vehicles in a hurry, along with the Reaper Liner paints and Secret Weapon Weathering paints. I employed my usual system of placing the washes and wiping away the excess with the sponges and my larger brushes. You can see this process under way on the cab. 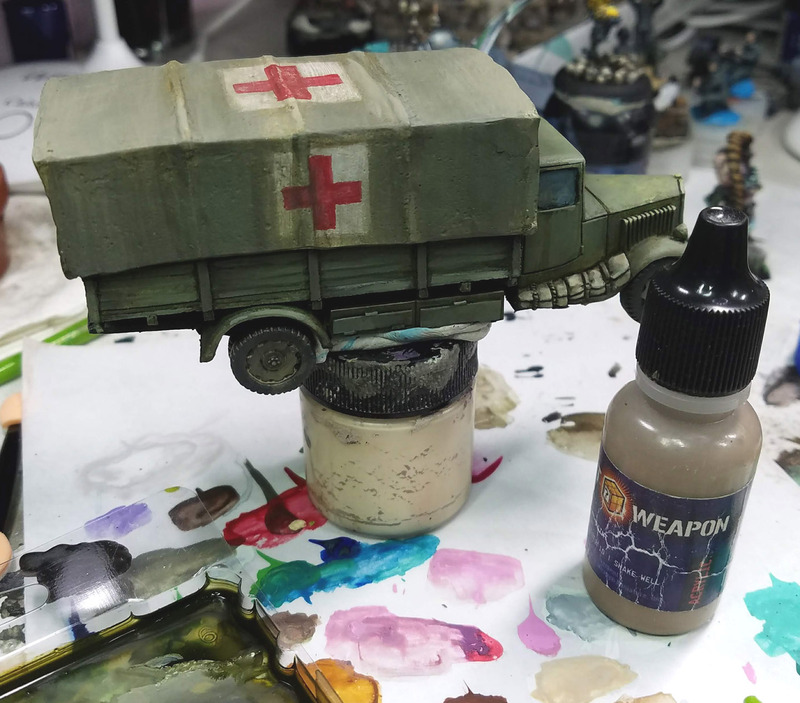 Mixing in Blue and Brown liner every so often to darken or alter the color temps a bit, I worked towards the back of the Citroen truck (a resin and metal figure from Warlord Games). 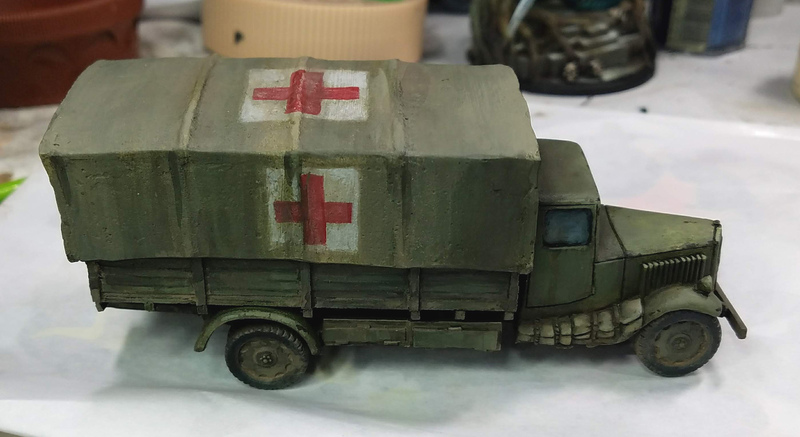 On the canopy, I used a little more of the sepia wash, and made sure to scrub quite hard as I wiped it away from the recently painted ambulance markings. 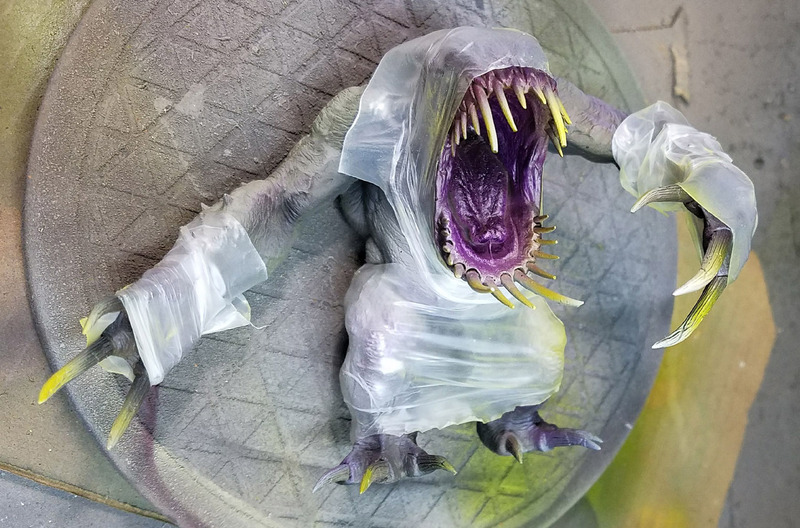 The idea was to try and wipe some of those away, as markings on cloth/canvas can fade and crack away more rapidly because of the flexible surface, etc. Then it was time to do a bit of dust and fading with the Secret Weapon Weathering paints! 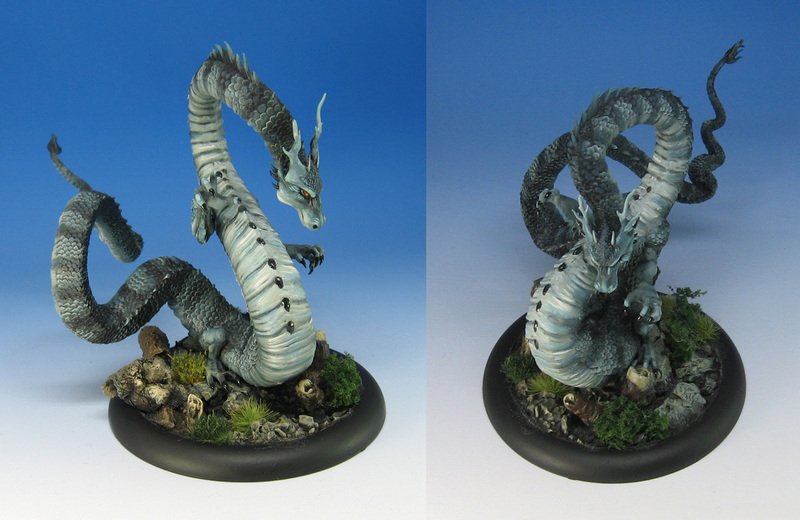 This worked in reverse of the darker shading washes. I wanted the lighter 'dust colors' to stay in the crevices where the canvas was stretched over the frames. Again, this all had to be done very rapidly, so I could not employ the oil paints as I normally would. 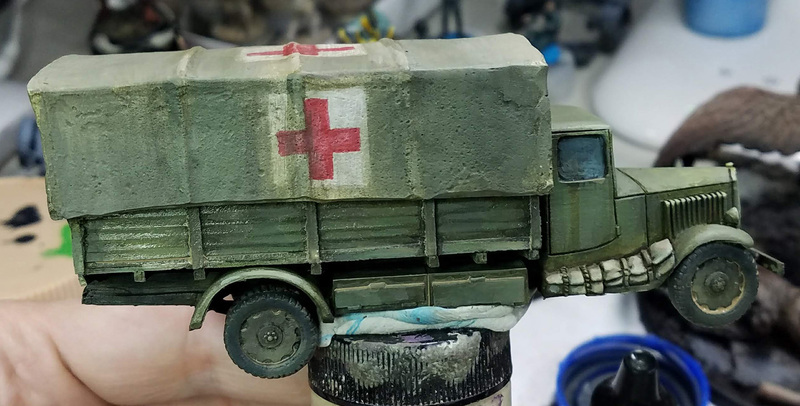 I also made sure to have these glazes go over the top of the ambulance markings, which would give me a second type of weathering and wear on them. Once that was completed, I needed to quickly apply some dirt and dust to the wheels and undercarriage. 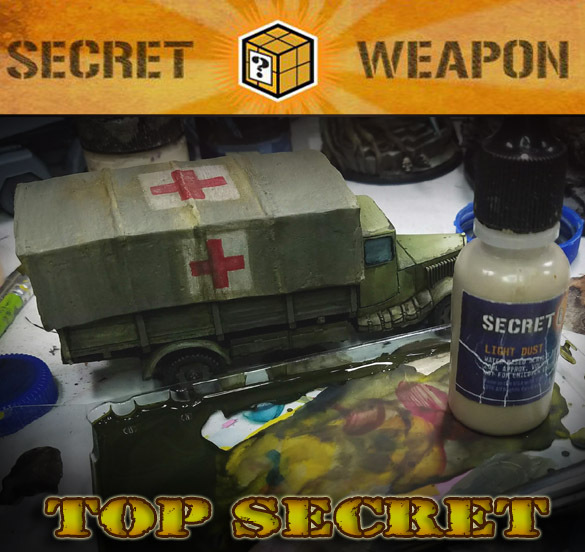 There are dozens of Secret Weapon weathering paints now, and this one is quite perfect for that... and it just so happens to be called "Light Dust". As before, this was applied mostly as a wash, and wiped away. There were plenty of crevices and crannies to leave some behind! 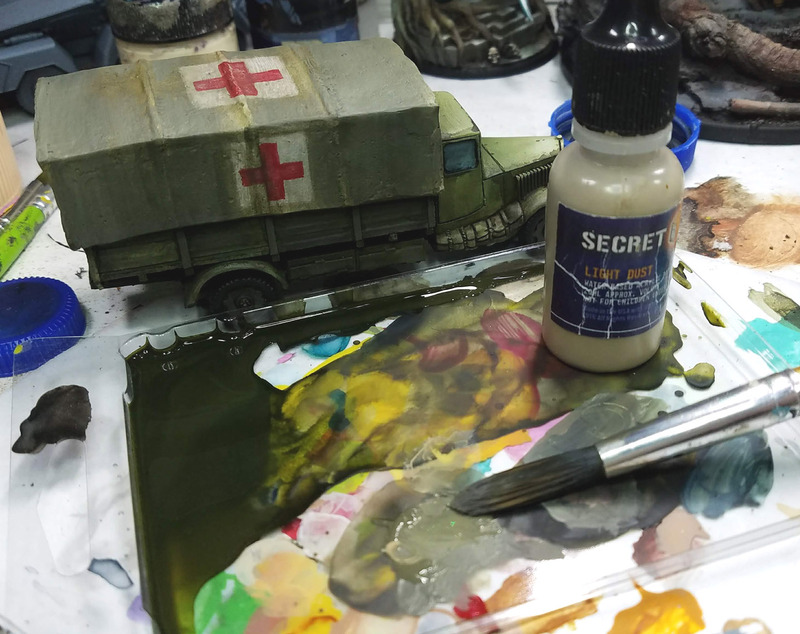 The Secret Weapon paints are designed to 'flow' a bit like oils, and they are also meant to dry extremely flat, or matte. This gives them the extra bit of realism, as they match the kinds of textures you see in dust, rust and so on. One more substitute... this time adding the dust paint with some weathering powders. I just wanted to apply a few quick blotches of this here and there. 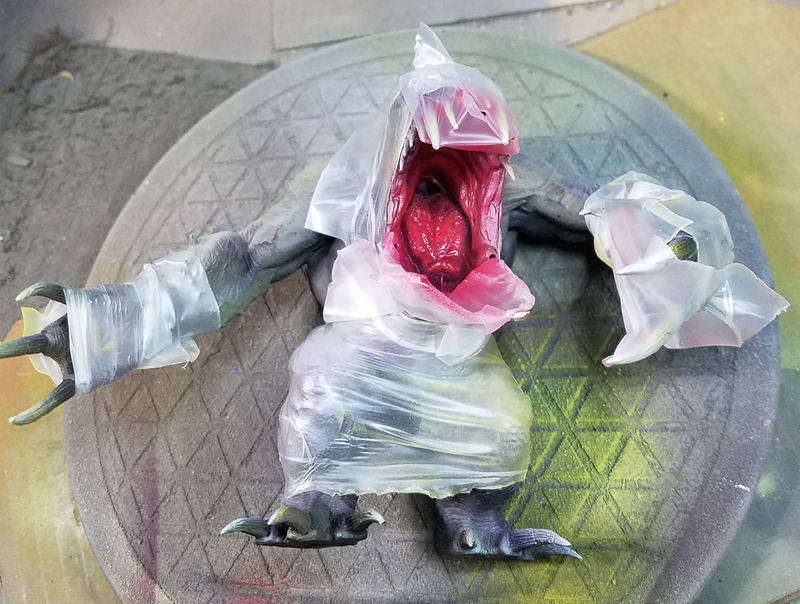 Again, normally I would use a set of mud products for this phase, but I only had about an hour for the entire painting process! After some spatter and a few other quick details, this was all set for the next battle report, The Bridge to Nouvion!! 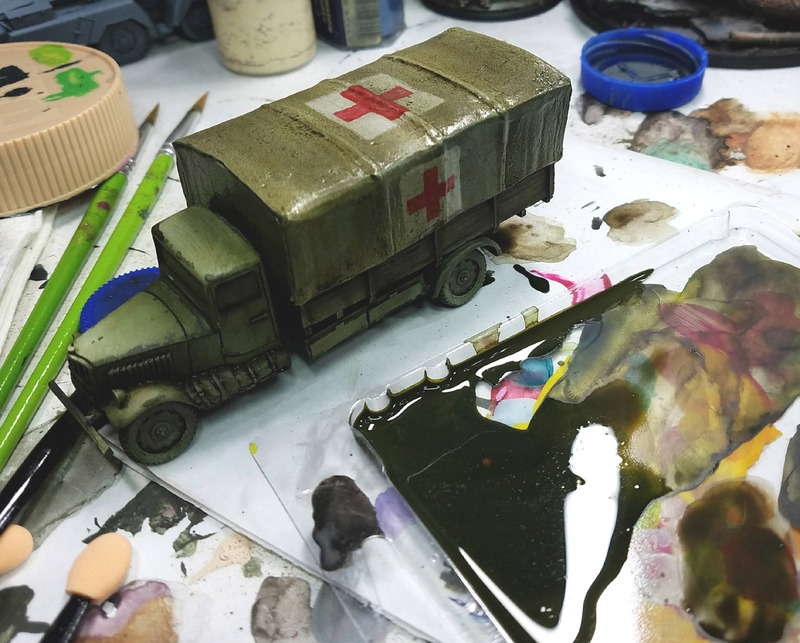 I painted these vehicles during a recent hangout on the Styrene Syndicate, having quite a bit of fun! 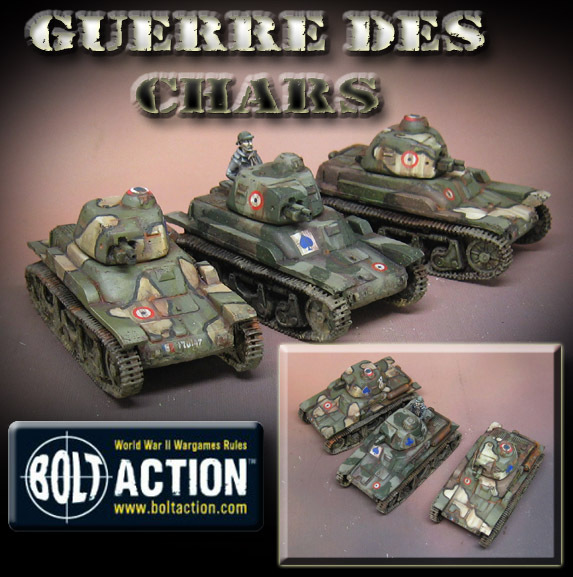 Eventually I want to be able to create a few battle reports that include these Renaults, plus the completed Somuas and Char B1 Bis. Eventually I may use them for Vichy French in a Torch campaign, or possibly for Syria. 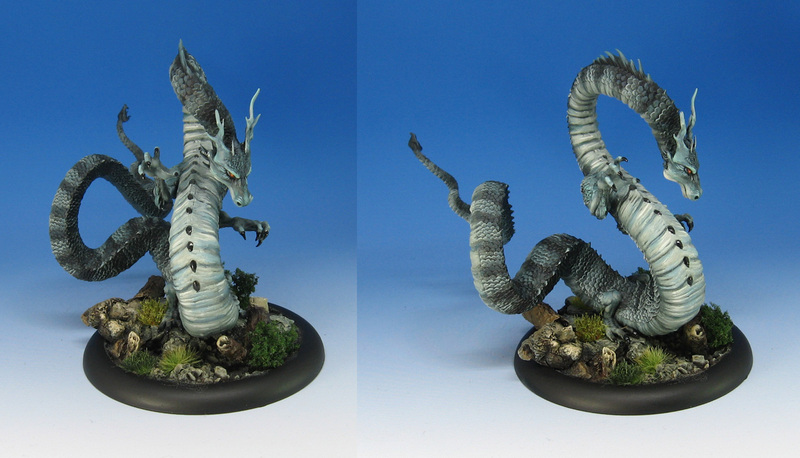 I have not tried to replicate any specific DLM units yet... I think that process will have to come later when I can figure out the best way to make more new vehicles, or acquire existing tank kits. Lately I have learned a great deal about how to scratch build vehicles! My intent was to film a battle report with them right away, so I wanted them to be as dry as possible. I also wanted to demonstrate what the Secret Weapon paints could do. Once things calm down here a little, I will try to do more Twitch broadcasts. 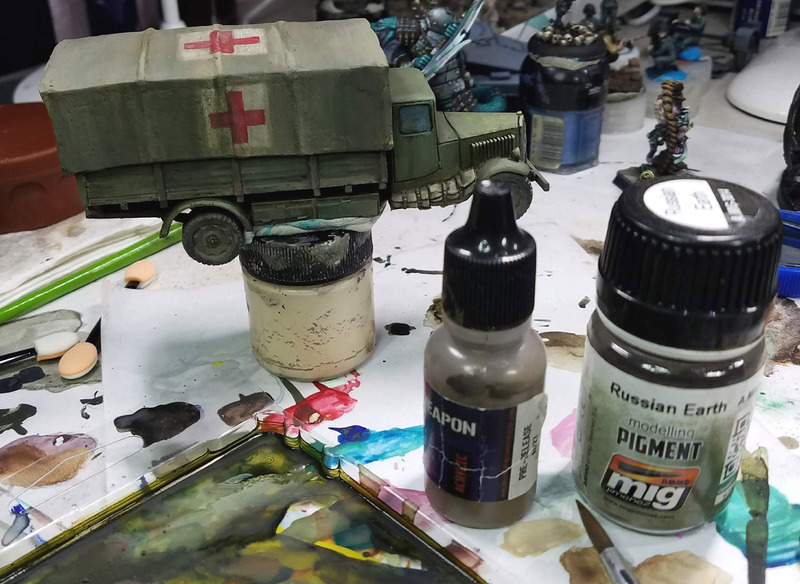 I think those will be even more useful than the Facebook live sessions for longer painting processes such as painting a platoon of vehicles! Those seem to be geared more for a "worktable" session, as opposed to a single very targeted lesson.